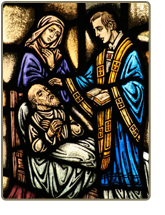 The sacrament of Anointing is intended for those in danger of death or are seriously ill. It is also for those who are awaiting or recovering from critical surgery; the elderly who are notably weakened and dealing with the debilitating effects of aging, even if no serious illness exists; those failing with major chronic ailment like cancer, heart disease, stroke, dementia, Parkinson’s disease, or multiple sclerosis; those serious mental illness; or sick children who have achieved sufficient maturity to understand the nature of the sacrament and desire to receive it. Please call the parish office if you need a priest for the sacrament of Anointing – (386) 428-6426.